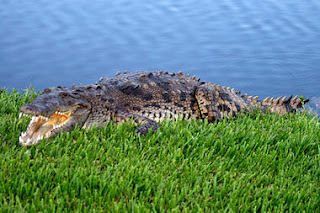 Alligators are a common sight in parts of Florida, but residents of a gated community were shocked to spot one of the animal's reptilian cousins: An endangered American crocodile. Crocodiles — which number about 1,500 in the state — are typically found some 300 miles (500 kilometers) south in the warmer Florida Keys. But the shy and reclusive animals are so rare in places like St. Petersburg that a wildlife official didn't initially believe Shondra Farner when she called to report the crocodile. "He said, 'No, ma'am, you have an alligator,' and I said, 'No, I know the difference,'" she said. Farner spotted the croc over the weekend in her backyard by the community pond. By Thursday, experts hired by the Florida Fish and Wildlife Conservation Commission had set a cage trap filled with beef loin in hopes of capturing the giant reptile. Unlike alligators, the endangered crocodile can't be killed. But officials will release it into Tampa Bay and could implant a magnet meant to disorient the animal and prevent it from returning to neighborhoods. "That big boy was just about 8 feet (2.5 meters) from our patio," said Farner, who snapped photos of the croc with its mouth open. "It's terribly scary looking. And fast. When he turned to leave, I couldn't believe how quick he was." The reptile's gender is unclear. Lindsey Hord, the crocodile response coordinator for the wildlife commission, said it's possible that this is the same reptile spotted south of St. Petersburg in 2008. Hord said the crocodile is living on the ducks that swim in the water. Farner had recently seen crocodiles on a trip to Costa Rica and recognized the animal's narrower, more triangular snout. Alligators not only have wider, more rounded snouts, but they also don't like the brackish and salt waters that crocs can live in. Hord said that despite their ferocious reputation, the state has never documented a crocodile bite, though people are occasionally bitten by gators. Still, she urged people to not feed or touch alligators or crocodiles and to keep pets away from them.